Fall alert systems for seniors have become some of the most popular types of elderly monitoring devices today, and it’s easy to see why. They allow senior citizens to enjoy an independent lifestyle while enabling them to immediately ask for assistance in case of an emergency. Thousands of users from around the globe—from healthcare professionals to seniors and their families—rely on these kinds of technology in saving lives and preventing tragedies. As people age, they become vulnerable to incapacitating falls and other accidents that may render them unable to get help. Elderly monitoring devices allow them to easily send out alerts. Monitoring apps that have built-in fall alert systems for seniors are particularly impressive because they don’t just allow the user to summon help with the click of a button—they can also automatically send alerts when falls are detected. This is very important if the user is unable to push the help button because of disorientation, immobilization, or unconsciousness. These apps can be configured to call certain people in a customizable responder list. Not all situations require an ambulance or the fire department, after all, so the alert system can be set to dispatch a family member, a neighbor, or a caregiver depending on the situation. Automatic fall detection can ultimately help seniors save money by avoiding hospital transport, hospitalization, visits to the emergency room, and other unnecessary health care costs. 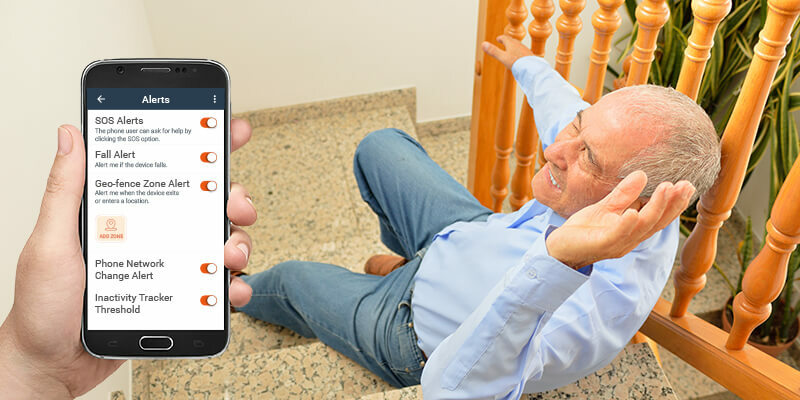 Elderly monitoring apps can be useful in many situations, not just falls. They can come in handy during a fire or medical emergency—or if the user is locked out of the house. They are designed to use the smartphones GPS to allow the family or caregiver to determine the users location quickly and accurately. Thus, elderly users can simply press a button and get help even if they are unable to say where they are. When shopping for a reliable senior alert app for your parents or yourself, take time to list down your primary requirements. This will make it easier to figure out the right solution to choose. Consider downloading the Senior Safety App and giving it a try. A comprehensive system, it offers fall alerts, SOS, geo-fence zone alerts, inactivity trackers, and many other useful features designed to assist the elderly and give peace of mind to their families. Backed by a ‘no questions asked’ refund policy, this $45 a year cost-effective solution is used by hundreds of thousands of people in 97 countries worldwide.